Home Articles What’s wrong with Dairy? Welcome to Veggie Bytes, addressing questions that vegans are often asked. Some of these questions are made in good faith. “Milk is good for you, so why are you against it?” There are two issues here: human health and animal welfare. Humans are the only species on the planet that regularly drink the milk of other mammals beyond infanthood. Cow milk, like human milk or camel milk or cat milk or possum milk or any other milk produced by a mammal mother for her mammal baby, has evolved to provide species-specific nutrients to very young beings. Polar bear milk makes baby polar bears really fat in about two weeks because polar bears live in cold places where a thin cub would die. Gazelle milk enables baby gazelles to develop the capacity to run really fast in a couple of hours – while cheetah milk enables cheetah cubs to run even faster in about six months, thus giving baby gazelles the chance to develop other capacities to ward off their predators and stay alive. Cows’ milk is rich in lactose, a sugar that is digested in the intestinal tract of, er, cows. Humans do not have the ability to digest lactose, and often suffer from bowel cramping, diarrhoea, bloating, eczema, vomiting and inflamed mucous membranes when they drink cows’ milk. There is a healthy pharmaceutical industry response to this in the form of antacids, anti-diarrheals, laxatives, skin lotions and other responses to the physiological rejection of a non-food food. This of course is not part of the dairy industry advertisements, which feature healthy children developing strong bones and teeth from a diet rich in milk, cream and sugary ice-cream. This “Western diet” has contributed to a global crisis of obesity, osteoporosis, diabetes, heart disease and cancer – to which the pharmaceutical industry has a healthy response in the forms of diet formula, chemical alternatives to food and expensive calcium supplements. pasteurisation – boiling milk at very high temperature to destroy TB bacteria – also makes milk harder for humans to digest. One of the many myths about cows’ milk is that it is good for human bones and therefore essential for growing children and women. This is not true – cow’s milk contains excess quantities of methionine, an amino acid found in mammals that helps in digestion by dissolving food in an acid bath. The acidity of the cows’ milk methionine is fine for calves but too acidic for humans. Cows digest their food by regurgitating it and swilling it in strong acid; humans do not. When humans drink cows’ milk their bodies compensate for the high proportion of methionine by leaching calcium from the skeleton, thus increasing the risk of osteoporosis. Another thing to think about while reaching for your icecream or daily glass of milk is the fact that cows are fed a toxic diet of hormones, mainly oestrogen, to make them produce more milk. They are also almost always pregnant while being milked, adding to the hormone-load which has been linked to early onset puberty in human children and to hormone-dependent cancers such as testicular, prostate and breast. Like humans, cows produce milk when there is a sufficient hormone load to indicate pregnancy. But milk cows are not always pregnant when they lactate; instead they are injected with excessive quantities of oestrogen (which gets passed on to humans through the milk). However the majority are artificially inseminated on a regular basis so that their natural hormones kick in as well as the artificial ones. Cows, like humans, bear live babies so their pregnancy is also a period of hormonal changes aimed at producing a bond between mother and child. 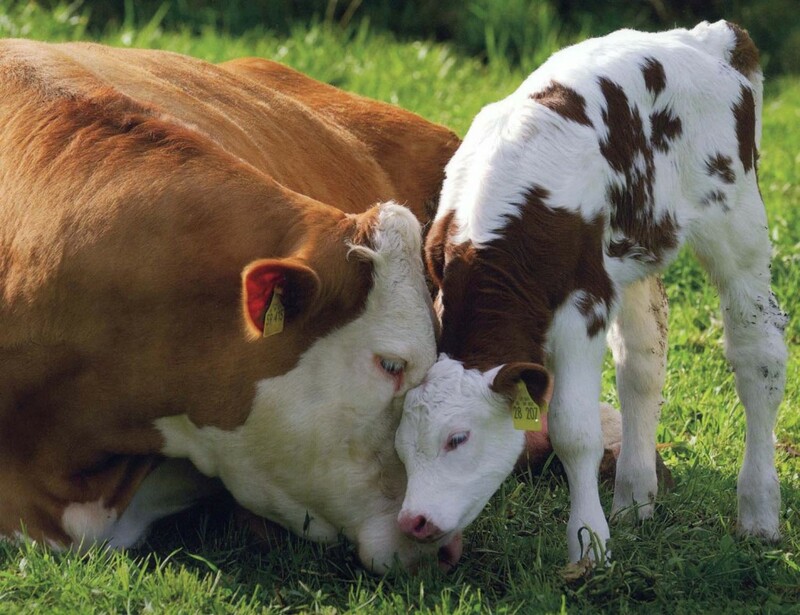 Like women, cows experience mood changes and are hard-wired to learn to love their baby before it is born. Unlike women, cows are never allowed to.